Visiting Bollullos par del Condado and looking for a location to swim? Nice selection! Don't forget to tell us how did it go. Introducing now Piscina-Municipal Cubierta - Bollullos par del Condado swimming pool, a great swimming pool sent by a swimmer like you couple of days ago. Have you visit this pool? Do you perform here? Please, contact us if you have information that you simply consider is gonna be beneficial and bear in mind from now on it is possible to now promote each and every pool just by sharing this page with your friends or adding comments in the Facebook boxes below. 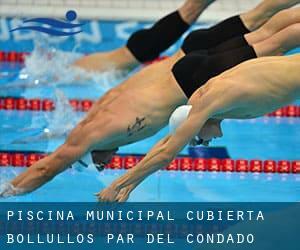 Come on and help this pool to be the very first in Bollullos par del Condado! Among all the activities offered by the center, for anybody who is interested in swimming you can take pleasure in 25 meters x 12.5 meters, 6 lanes, 1.8 meters depth, 1.8 meters depth, Indoor/Outdoor. If you need to contact this Swimming Pool, email address and phone number are both number. Updated on 2019 ARAGON, 35 1ºD 21002 - HUELVA , . Avda. San Sebastián, s/n , Huelva , Spain (Postal Code: 21004). This sports center delivers 25 meters x 12.5 meters, 6 lanes, Indoors. Contact information and facts for this Swimming Pool including phone number and e-mail address are number. Avenida Manuel Siurot 40 , Huelva , Spain (Postal Code: 21004). This sports center offers Olympic size x 25 meters, 1.4 meters - 1.8 meters depth, 1.4 meters - 1.8 meters depth, Indoor/Outdoor. For this Swimming Pool, only phone number is number here. Calle de la Encina , Lepe , Spain (Postal Code: 21440). Among all the activities offered by the center, if you are considering swimming you will take pleasure in 25 meters x 12.5 meters, 6 lanes, Indoors. If you'll want to make contact with this Swimming Pool, email address and phone number are both number. Updated on 2019 EL GRECO, 9 21610 - SAN JUAN DEL PUERTO (HUELVA) , . Updated on 2019 AV. PIO XII, 11 21006 - HUELVA , . Updated on 2019 MALAGA, S/N LOCAL 1 21004 (HUELVA) , .